When we built our house I said all I wanted was a huge kitchen island. These days I'm thinking I should have asked for two dishwashers. There are only four of us but I swear our dishwasher is always full. As is the sink. And the two counters surrounding the sink. Every time clean dishes come out of the dishwasher, it gets filled right back up with dirty ones. And there are still dishes waiting to go in on the next round. Don't tell me I bake too much. This is not the problem. It's the darn size of the dishwasher!! I need to butter my hubby up sometime and mention the fact that I want two dishwashers in the next house. Just to get him warmed up to the idea, you know. One good way to butter hubbys up is to give them ice cream torte. 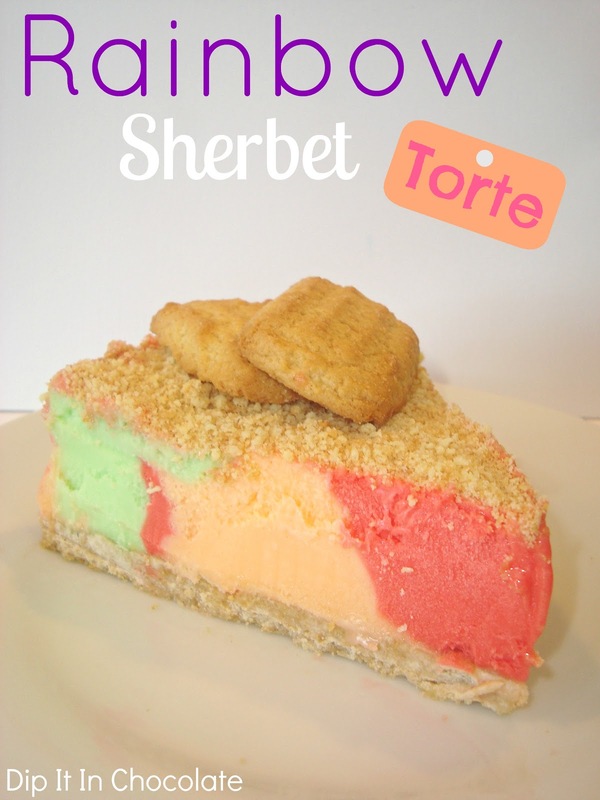 I realize that this is actually a sherbet torte, and that sherbet is... um... kinda girly. But it's a good starting point for a two-dishwasher kind of conversation. Also, it's bright and happy. Just like my face will be when we build a house with two dishwashers. 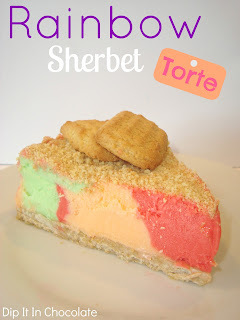 I always forget that rainbow sherbet is good. I mean, I would never go to the ice cream store and order sherbet, but whenever I end up eating it I love it. This is a fun torte to make for dinner guests in the summer and is easy to throw together. I have actually made it two ways, both of which are delicious so I'm posting two (very similar) recipes. The biggest difference is the crust- one uses coconut cookies and slivered almonds and makes a true crust. The other uses macaroon crumbs, chopped pecans, and whipped cream and makes a thick creamy "frozen topping" type crust. I have a hard time finding macaroons and usually don't want to make them (lazybutt) so I often make the first recipe, but if you have macaroons the second recipe is killer. Today our kids are in bed with fevers and flu so I thought this would be a good time to post some of my old recipes before the Olympics next week. I'm not sure I can watch Tangled or Blue Planet one more time. 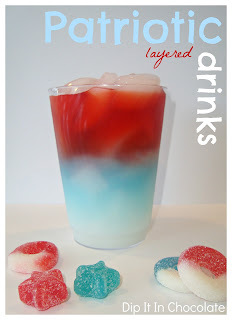 These drinks were all over pinterest and we couldn't resist trying them for the Fourth. I was not at all convinced they would taste good and was pleasantly surprised. I think my red and white layers combined pretty well although I didn't really care for the blue. I didn't really like the Polar Blast Hawaiian Punch as it is though, so that was probably my problem. In case you haven't done these, the secret is to fill your cup up completely with ice and then pour the drink right on top of the ice as slowly as possible. Sometimes it's good to wait for a minute and let the drink settle before continuing to pour more. You absolutely must layer these drinks in the right order. Check the label on the back of the drink and look at the sugar content. The highest amount of sugar is the drink that should go on the bottom. The lowest will go on top. (No sugar/calorie free is fine for the top.) My white layer and blue layer were only about 7 grams different in sugar and they ran in to eachother a bit, so if you want really defined layers, choose sugar contents that are pretty drastic. I have a Halloween version of these floating in the back of mine brain so hopefully it will make an appearance come October.